Detailed Backblaze review, looking at this industry-leading backup provider's features, ease of use and value for money. Backblaze is simple, user-friendly and a great solution if you’re looking to backup all your data with the minimum of hassle. It boasts excellent security, unlimited data storage, and a reasonable price, and is a practical choice for users looking for easy-to-use backup software. You can read a detailed review below or sign up now. Backblaze offers just two price plans – Personal and Business. Both come with unlimited data storage and the full set of Backblaze features, so there’s no need to upgrade to a more expensive plan to get the most out of the software. Personal backup is available for $5 per month, $50 per year, or $95 for two years. Business customers pay $50 per computer, per year. There are no other setup costs, and no maximum number of computers that can be added to the account, although it must be a minimum of five. If you don’t want to commit to a subscription straight away, you can also opt for a 15-day free trial, which is available for both Personal and Business plans. Both trials come with full access to all subscriber features, and we’re pleased to report that you don’t need to enter your credit card details when you sign up. As well as letting you hang on to your privacy, this also means that if you don’t want to go ahead with a purchase, you won’t have to worry about being automatically charged. Compared to other providers, Backblaze’s pricing sits comfortably at the lower end of the spectrum, charging a reasonable price for a good all-round service. If you do decide to sign up, payment can be made with most major credit cards, including Visa, Mastercard, American Express, and Discover. Unlimited storage space, automatic backups and stellar security make Backblaze one of the most traditional online backup providers on the market. Although this means it’s not ideal if you’re looking for sync and share options or quick access to your files, it’s perfect for keeping up-to-date copies of all of your files safely stored online. Backblaze started life in 2007 and is the brainchild of current CEO Gleb Budman and CTO Brian Wilson. Both previously worked together at MailFronteir, developing anti-phishing and anti-spam email filters before moving into online backup. Now fronting Backblaze, they are located in San Mateo, California and are known for their innovative storage pod design, as well as for documenting their product development online. When it comes to storage, Backblaze’s buzzword is ‘unlimited’; unlimited storage, unlimited file sizes, unlimited file types. If you sign up for their personal plan, you’ll get as much storage space as you could possibly want, and plenty of flexibility in how you can use it. It’s worth noting that some file types (such as EXE application files and ISO disk images) aren’t automatically backed up, although this can be changed by altering your settings. All default restrictions are in the name of speed and utility; the idea being that the majority of people want to backup text documents, photos, videos, music and so on. If this is the case, then excluding non-user generated and temporary content will make most backups more streamlined. One of Backblaze’s main selling points is its simple, automated backup process; all you need to do is set it up and let it run. In its default state, Backblaze will backup absolutely everything in supported file formats, leaving no stone unturned. If you’d prefer to be a bit more selective, you can simply choose which files you want to exclude – a much quicker process than having to identify the (typically much larger) selection of files that you do want to save. Although great for those wishing to perform a straightforward, full backup, things can get difficult if you want to store a more specific selection of data – not least because you can only exclude folders, not individual files. If you’re looking for a service that enables you to fine tune which files are backed up, therefore, Backblaze may not be the best choice for you. For users looking for something low-maintenance, however, it’s a solid choice. Backblaze’s data backup is a continuous process, so every new document and updated file will be instantly uploaded to the Cloud. If you’d rather have more control over when this takes place, you can alter the schedule in settings – instructing the program to run once a day, or only when you tell it to. The Backblaze Personal account only works for one computer, but it can also be used to store files taken from an unlimited number of external drives. The service is free of charge and is compatible with USB, Thunderbolt and Firewire drives – although NAS hard drives are not supported. Just plug in your drive during backup, and the files will be transferred automatically. Backblaze is compatible with both Windows and Mac operating systems, and its mobile application can be used on Android and iOS phones. The Backblaze app allows users to access and share files from their mobile device, making it easier to access data on the go. Although all content can be viewed in the app, mobile users won’t be able to download individual files of over 30MB. So far as mobile security is concerned, you’ll need to sign in with your Backblaze email and password every time you launch the app, and all communication is sent to the Backblaze datacenter through an HTTPS (encrypted) connection. Backblaze has no integrated file sharing options at this time. Many Cloud backup services use up a lot of your computer’s CPU, causing other programs to run slowly. Backblaze has tried to evade this common problem by designing software that has minimal impact on your PC’s performance – and they’ve succeeded. By avoiding memory-intensive processes like installing drivers, and utilizing a slow scanning system that opens files in read-only mode, Backblaze rarely uses more than 1% of a computer’s CPU. So far, so good! 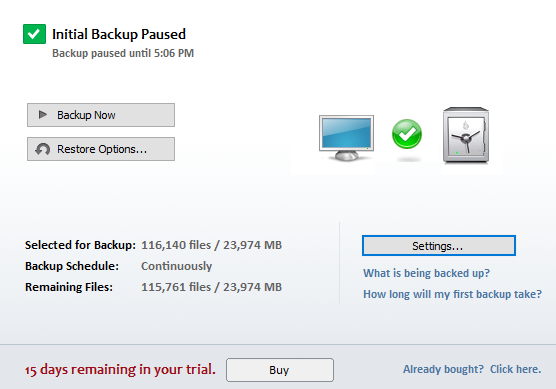 The problem is that this does come at a price; a fast computer means a slow backup (see our ‘Speed’ section below). You can check your upload speed in Backblaze itself, by clicking on Settings then choosing the Performance tab – the speed is displayed at the bottom of the page in Mbps. 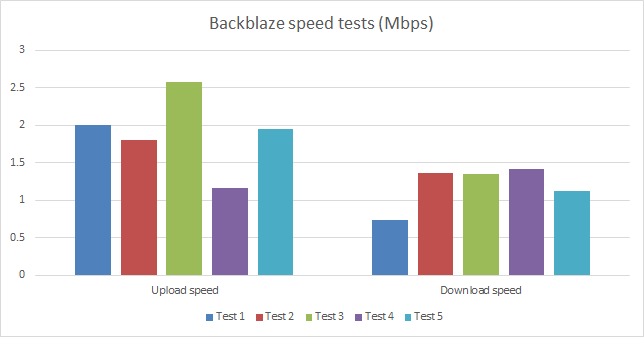 We ran five upload and five download tests to monitor the transfer speeds of files ranging from 30MB to 1GB and recorded our findings; you can take a closer look at the results in the graph below. As you can see, Backblaze’s low impact file transfer system really does slow things down – an average upload speed of just 1.9 Mbps means that you’ll be waiting a long time for your backup to complete. Downloads are even slower at approximately 1.2 Mbps, confirming Backblaze’s position as one of the slowest providers out there. Obviously, the reduced impact on your normal computer processes will make the compromise worthwhile for some, but if you’re searching for something speedy you may want to consider looking elsewhere. Backblaze’s website estimates that initial backups should take around 30 days, and advises users with very large amounts of data or a slow internet connection to consider using a different service. Backblaze offers a limited versioning service, in which old saves of your documents are retained for 30 days before being deleted. This is a helpful tool if you ever want to read back over an earlier version of a document, to retrieve deleted information or pinpoint when a particular change was made. Although some backup providers offer unlimited file versioning, this is a handy feature that’s worth having even in its limited form. Common wisdom states that you should backup your files three times – once online, once on a local device and once on a remote device. This should mean that one copy of your data will survive no matter what happens. For example, environmental damage such as flooding can’t affect your online storage, while problems with your internet will leave external hard drives intact. Should it happen that you lose access to your online storage and don’t have a physical backup to hand, however, all is not lost. Upon request, Backblaze will send you a hard drive containing all of your data, courtesy of FedEx. Drives are shipped within 3 to 10 days, with large quantities of files taking longer to prepare. This service isn’t cheap, with a 128GB Flash Drive setting you back $99, and 4TB available for $189, but in an emergency, it could definitely come in useful. Not a feature in the usual sense, but this is something we think you should know. According to the Backblaze website, their storage is not designed as a permanent archive, but as a regularly-updated mirror of your hard drive. This means that, if you don’t access your online files for six months, they will close your account, and all of your data will be deleted. So if you want to find a safe place to store things long-term, Backblaze may not be the best option for you. Backlaze’s security measures are some of the best out there, with end-to-end encryption and high-level security measures available. During backup, Backblaze encrypts all files automatically on users’ computers and then sends them to one of their datacenters via a secure SSL (HTTPS) connection. Once transferred they are stored, still encrypted, on disk. When you want to retrieve files, entering your login details will activate the decryption of your data, allowing you to browse and access them freely. Backblaze’s encryption is military-grade and uses both public/private and symmetric key algorithms, and additional layers of protection can be added using two-factor authentication and private key encryption. The latter is an important feature for the security-conscious, as it means that only you hold the information required to decrypt your files – it’s never recorded or stored by Backblaze, and cannot be reset if the original is lost or forgotten. It’s a very good security measure, but if you ever lose the passphrase you’ll permanently lose access to your files, so be careful! All data backed up using Backblaze is kept in Storage Pods in the Backblaze datacenters. These centers are equipped with redundant power and biometric security, ensuring that they will be protected from most technological and natural disasters. The buildings are also monitored by staff 24 hours a day, seven days a week, so data is never left vulnerable to outside interference. Backblaze subscribers that run into difficulty have access to a live chat and a support ticket system, the latter of which promises to send a reply within one working day. The live chat is useful for US customers, but not much help for those in other parts of the world, as it’s only open between 9 am and 5 pm PST (with an hour’s break from 12 to 1 pm). The ticketing service is easy to use, and also features a tracking system that allows you to check on the status of your request before it is answered. We didn’t find that knowing our request was ‘awaiting assignment to a support agent’ told us much we couldn’t have already guessed, but it was reassuring to know that our request hadn’t been forgotten. The primary resource for customer support and troubleshooting on the Backblaze website is their Knowledge Base, which contains answers to frequently asked questions and a few basic guides to changing your settings and restoring files. It’s not the easiest resource to navigate, however, and their insistence on referring to Q&A-style guides as ‘forums’ doesn’t make things any clearer. If you’re willing to trawl through the posts you’ll probably find the information that you need, but sending a ticket is much easier and catching someone on the live chat is by far the quickest option. In our experience, Backblaze’s ticket response time is pretty good – we submitted a request at 5 pm, and had received a reply by 8.30 the same day. The response was friendly and personalized and gave a direct and helpful answer to our question. You’ll also find a rather sweet ‘meet me!’ link at the bottom of your reply, inviting you to view their helper’s profile on the Backblaze website. Admittedly, it doesn’t get the problem solved any quicker, but it’s a nice touch and suggests that they’re making the effort to keep their service human. When we were able to access the live chat (being based in Europe, this required a bit of careful scheduling), we got almost instantaneous replies and clear, helpful information. Backblaze is well known for its social media presence, and its writers are particularly active when it comes to giving followers an insight into the creative process. With Twitter, Facebook and blog accounts all receiving regular updates, they broadcast information on new designs and innovations, sneak-peeks into their office and workrooms, and interesting snippets of industry news. They frequently reply to comments, and most questions (technical or otherwise) do get answered, although troubleshooting is not their primary focus. Backblaze also maintains a YouTube channel that features video insights into the company’s most recent developments, as well as a Complete Guide to Computer Backup Options which could come in handy for the novice user. Signing up for Backblaze is simplicity itself – there’s a clearly signposted store on their website, and getting started is just a matter of a few clicks. Subscribers will need to give their card details and a ZIP code, while the free trial requires just an email and password (no card details). The installation is straightforward too, with the 5MB file taking just a few minutes to install. Once downloaded, Backblaze’s control panel is very simple to use; you can choose to start or pause your backup, explore restore options or change your settings, and that’s about it. If you want to have everything backed up with the minimum of hassle, this makes things very easy – the program starts backing up automatically, so all you need to do is let it run. Modifications can be made by selecting Settings, and all options are clearly signposted. Excluding files that you don’t want to store is pretty straightforward too – all you need to do is select the Exclusions tab from Settings and then add the folders that you want to leave out. You can also approve automatically excluded file types and folders, and restore default settings if you change your mind. This works well if you’re happy just to backup everything you’ve got, but if you want to be more selective, it’s almost impossible to single out particular files to keep. In addition to this, the upload of new files can take a while to start, making it quite frustrating if you’re in a hurry and want to be sure that your files are being backed up. When it comes to retrieving your files, you’ll need to go to the Backblaze website, from where you can request them as a free ZIP download, or on a flash drive or hard drive sent (for a charge) by FedEx delivery. We went for the ZIP option, and received an automated email once our files were ready to download, after which we had to return to the website to begin the download. While we didn’t encounter any significant problems with retrieving our files, the process was annoyingly convoluted, running counter to Backblaze’s low-input attitude. While other providers allow you to retrieve files just using their desktop app or website, here you have to keep an eye on your emails, downloaded files and their website all at once. Using the free Backblaze app is just as easy as accessing their software from a computer. You can’t upload any files from your phone, but it’s easy to browse through your online backup and download files as and when you need them. Once you’ve installed the app, you need to enter your account email and password; your details can be remembered if you like, or you can re-enter them each time you log in. It’s then easy to browse through your backed up files, which are arranged in much the same way as on a computer, and choose which you want to recover. There is no way to view files before downloading them, but documents that have been recovered can be easily found in the ‘Downloads’ tab. True to form there are no fancy flourishes in the Backblaze app, but it’s convenient, functional and extremely easy to use. While it’s not the best choice for those wanting a highly customizable backup service that can be adapted to meet specialist needs, Backblaze is an excellent option for the less technically-minded. Although a little slow, it’s user-friendly and straightforward, and its impressive security features show a reassuring commitment to keeping your data private. It’s the perfect choice if you want a full backup service with minimal restrictions that makes few demands on your time. What do you think of Backblaze? Leave us a comment and let us know your thoughts! I have no problem with the service from BAckblaze but my monthyl fee went from under $8 per month to almost $13. I am looking for something more in line with the other prices I am seeing, your info on BAckblaze is seriously out of date.